I just love love love Chinese food. 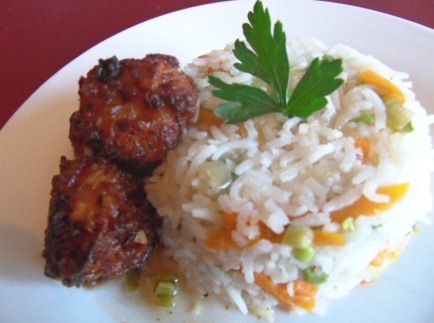 My favourite dishes are Veg Fried Rice with Gobhi Manchurian. When I am stressed or happy or just plain bored with cooking, I order these two dishes. When I go out, I always order these two dishes if I can have my way. Everytime I look at a menu, I try to find them. You can say I am obsessed with them. So when hubby suggested making them at home, cos you know, you can’t get them the way they make it at Hotel Mathus, Chennai (the staff came to know me by first name as being their most regular client with the set meal plan), I turned to Tarla Dalal for help. Tarla Dalal is a very famous Indian cookbook author with scores of books catering to all types of Indian vegetarian cuisines under her belt. Her recipes are to the point without too many big words or difficult techniques. The best thing I like about them is the ingredient measurements are accurately mentioned and easily available. It is very easy to imitate the recipes and create the dishes at home. I modified the recipes a little bit by using not too much capsicum, no celery and definitely no Ajinomoto in Vegetable Fried Rice. Instead of Gobhi Manchurian, I made Vegetable Manchurian (no Ajinomoto again, of course). Also, the preparation of Chinese Rice mentioned on the website makes the rice quickly and keeps it au dente with all the grains separated. We made Chinese for dinner yesterday. And by we I mean HD helped out. We split the chores. He made the gravy while I made the vegetable balls. He grated the vegetables for the manchurian and I made the noodles 😀 The system worked pretty well cos the end result was good enough for angles. Chop finely the cloves and green chilli and mix with the cabbage, carrots, flour and cornflour using a little water to bind. Add salt and pepper. Heat oil in a frying pan. Make small balls of the batter and fry them in the pan. Drain the oil and keep aside. Heat 2 tblsp oil in a pan and fry the onions till light pink. Add cabbage and carrots and fry them. Add 500 ml water and the Knorr Vegetable Manchurian powder. Bring to a boil and then let it simmer for 5-7 minutes. Add the vegetable balls and serve.